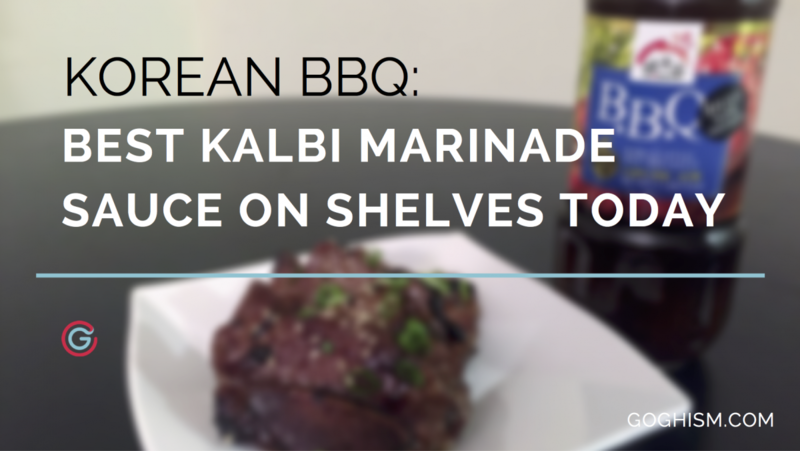 After 27 hours of cooking, researching, and testing seven different brands of bottled kalbi marinade sauces, we’ve concluded Haioreum Korean Style Beef BBQ Sauce to be the best kalbi marinade sauce you can buy on shelves today. It has the boldness to be a little out there and present some non traditional flavors, and the confidence to let the meat be the main attraction and not overpower the richness of the ribs. 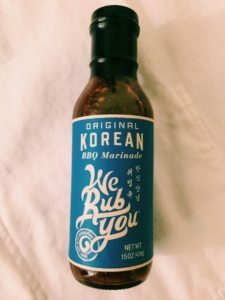 We also have to confess that when working through this piece we were surprised at how similar the flavor components were to the sauces in our Bulgogi Marinade post, but with such vastly different results. It’s amazing how you can take the exact same ingredients, but with a different cut of beef, and produce completely different results. I’m really glad that we could fill out our roster a bit with some quality marinades. Takumi was definitely an underwhelming runner up. Although Haioreum managed to keep its top spot the top three are definitely a lot stronger overall. And we are all the better off for it. When I first opened this bottle of sauce I immediately thought of ketchup and Worcestershire sauce, not really what I would normally put on a good cut of beef. To be honest I thought it was A1 Sauce for a second. But surprisingly enough it worked really well with the ribs. It added a great tang and acidity that accentuated the richness of the meat. There’s also a good amount of sweetness that when combined with the tang of the tomatoes and the fattiness of the meat produces an overall complex and full flavor. 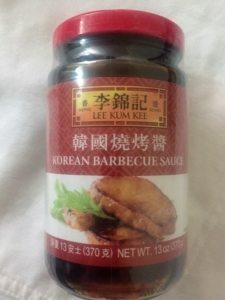 It’s funny to me that a Korean brand came out with a bottle of sauce that has such distinctly American flavors but still worked so well. It could use some more garlic and soy sauce to bring it a little closer to what I’m traditionally expecting from kalbi, but it was definitely a nice change of pace and I like that they didn’t hesitate to play with some non traditional ingredients. I would definitely recommend this if you’re looking for an overall great rib dish, and although it might not be exactly what you’re looking for in the traditional/authentic flavor department it was the only one that truly elevated a more expensive cut of beef. Something a lot of other bottles of marinades and sauces have a very difficult time doing. Sempio continues the big brand trend of not straying too far between their bulgogi and kalbi marinades. Although I wouldn’t necessarily consider that carte blanche to substitute one for the other, the similarity lies in the resulting flavor profile, but bringing that out with such different cuts of meat requires very different ratios of salt, sugar, etc. Here, Sempio still brings that signature ginger strength as their primary flavor component and again it works well with the ribs. Sweetness is still nice and mild, does get kind of lost in the fray and I would say that it’s not enough to cut through the fatty richness of the meat, but the ginger does a good job of that instead. Overall solid work put into a bottle from the big boys. 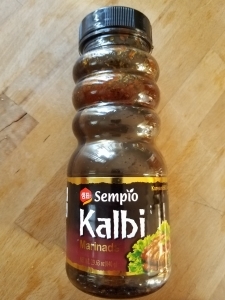 *The original Sempio kalbi marinade is unfortunately no longer available on Amazon, but try out their hot version and let us know what you think! Our infatuation with We Rub You’s work is pretty well documented at this point. This bottle of sauce is the swiss army knife of the meat world, versatility’s the name of the game when you have limited space in your fridge (like we do). Don’t get us wrong, you would have a pretty great night with a plate of kalbi doused in their Original sauce. However, due to their hybrid nature this one doesn’t pack the same punch and depth as the slightly more focused and specialized versions of Haieoreum and Sempio. What’s great for bulgogi comes out a tiny bit weak for kalbi. Still, for coming out of the same bottle the kalbi that comes out doesn’t fail to put a smile on my face. Just like Haioreum’s bottle of sauce I would say this was an interesting experience. Unfortunately though, unlike Haioreum’s, it goes the opposite way. I wish I could graph the ratio of flavor components over the ten second span of first putting this in your mouth to swallowing. There’s a bunch of sweetness that comes rolling in and initially I was afraid it would overwhelm and ruin the flavor of the meat, but then it just… goes away. What remains is a garlicky flavorful sauce. I can’t really remember any other time where the beginning is an unpleasant surprise but the aftertaste really shines, generally it’s the other way around (looking at you Malort). Kind of a shame really, that you can’t really fully appreciate the savory and rich sauce while you’re still thinking of the sweetness from the beginning — and just hoping it doesn’t come back. If you can get past the initial anxiety regarding the sweetness though, and you’re a slow chewer, this might be worth your evening. I was a little disappointed when I found out this was CJ’s after they did such a great job on the bulgogi marinade. It’s mainly one note, sweetness; and while that’s fine on an especially fatty piece it tends to overpower the rest of the meat. (I tend to go for the fattier pieces but for spare ribs you’re really talking like 10 – 20% of a piece of kalbi, which is kind of a shame to mask 80% of the ribs with an $8 bottle of sauce. If they pulled back on the sweetness and replaced it with garlic it would go a long way to helping this marinade climb the ranks. Overall this marinade reminds me of a couple of non-confrontational roommates off of Craigslist. You keep your distance, nothing major or offensive comes up, and everything seems normal while small annoyances and irritations slowly build up in the background. There is nothing negative that immediately stands out, but nothing positive that will bring you back for more either. There’s some nice fruitiness and it never reaches the chemical-like aftertaste that some of the previous bottles of marinade get to. What creeps up on you though is the saltiness, it’s surprising because you won’t think of the sauce as salty based on taste, but for some reason after your third or so piece you’ll be reaching for a cup of water and your lips will be burning. If you don’t have any problems with salty foods and you don’t want to take a major risk I would go with this one, it’s relatively safe flavor wise, but since you’re springing for spare ribs I wouldn’t really be OK with ‘alright’. This marinade has a lot in common with Assi’s. There’s a nice mild sweetness and a great mouth feel but nothing really here to blow you away. It does let the flavor of the meat come out, which is great, but the same gradual saltiness will creep up on you and become overwhelming. I felt as if I had just eaten some late night Chinese take out or a pile of fries. There are times when I’m looking to be hit like that, but not from a $20 tray of ribs. I spent many sleepless nights agonizing over whether to use kalbi or galbi. I’ve seen them used interchangeably, and even in the bottled sauces we profiled here there is no consensus. 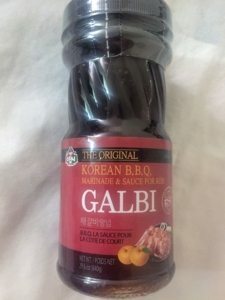 I tend to lean towards the galbi spelling, and the more reputable sources that I trust do the same (high five Maangchi). But in the spirit of convenience we’ll be going with the more Americanized kalbi as there is no definitive right answer, and the ‘k’ is closer to the pronunciation than the ‘g’. Now that I think of it, I don’t think I’ve ever had bad kalbi. It’s really hard to mess up cooking spare ribs that have been bathing in garlic, sesame seed oil, and soy sauce. Especially when the ribs are cut LA style, cooking time is more based off of how long you can wait, I’ve never been able to wait long enough to overcook or burn the meat, the more char the better. Or maybe since kalbi’s usually eaten on happy occasions there are always positive feelings tied to it (or maybe eating kalbi makes it a happy occasion). – Texture: this part’s big, and probably where you see the most variance in personal preference. I tend to align with American style ribs where the meat should be tender, but not completely falling off the bone; the meat should pull away cleanly and easily but with some resilience and chew. – We won’t be going into texture too heavily within this post as a large part of it depends more on the quality and preparation of the meat, as opposed to the marinades themselves. A good marinade can definitely help out but we’ve found that for the most part the impacts are generally the same across brands. 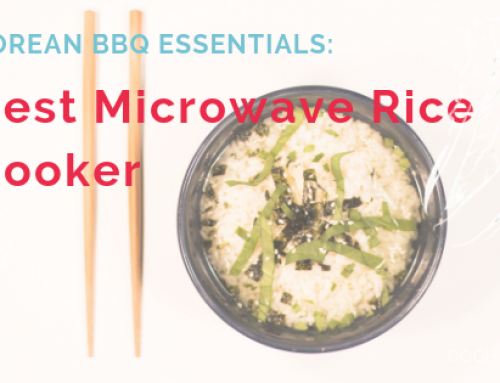 – Flavor (obviously): the components here are not all that different from bulgogi, the main hits are the holy trinity in Korean cooking of garlic, sesame seed oil, and soy sauce. The main difference is in the supporting cast as ginger generally takes a backseat and the sweetness tends to have an earthier more complex nature (such as brown sugar and honey) with less of the fruity sweetness (Asian pear). – Meat: this is the most important, and needs to be paramount. Spare ribs, especially when cut LA Style (across the bone), tend to be much pricier than what you would use for Bulgogi. Marinades should accentuate the richness and luxuriousness of the meat and not overpower it. I would compare this to pouring ketchup on a beautifully cooked steak – what’s the point of spending all that money then? 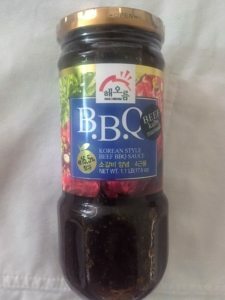 Consequently, marinades need to be much more careful here with the soy sauce and the sweetness, many people use kiwi, pear, or other fruits to help tenderize the meat, but you need to be careful that it doesn’t become the main flavor component. All in all everything needs to come together into a beautifully tender, rich, deep, earthy bite of food. And when I say deep it needs to be coming up from the tree roots like all great Southern BBQ does, but without the smokiness. I wouldn’t say this is the richest and most luxurious Korean dish in the world, but it probably holds a closer position to most boys’ hearts than its wealthy uncle kalbi stew (갈비찜). Those six components and the ratio therein, on a 1 to 10 scale we’re not looking for straight 10s here. Each sauce has it’s own combination. The easiest thing to do would be to say you should trust me because I’ve done my homework, because times I get to eat kalbi are probably the highlights of my life, because I don’t have room in my fridge for anything else at the moment. If I’m being honest with you my biggest argument would be my pure, youthful, innocent intentions of hoping the world makes and eats more kalbi. The more there is the less likely I have to make it myself. The real reason why you should trust us, is that we’re not asking you to. Either have a little faith in our process or join in. We’re going to be performing blind taste tests, with as many testers as we can pull off the streets, and posting the results. Try them on your own and let us know what you think, maybe we got unlucky and went 100 straight people who didn’t know they have a garlic allergy. We’re all former pre-med students so we’ve spent enough time in a lab to break a beaker or two. 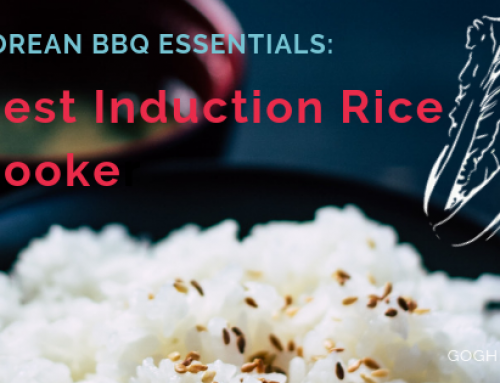 Every kalbi sauce or marinade will get the same cut and amount of beef (two slices of LA style spare ribs), duration it will soak (12 hours), cooking method (cast iron skillet), and cooking time (4 minutes per side). The skillet will preheat on high for 10 minutes and there will be 50 grams (roughly ½ of a cup) of sauce or marinade per portion. We’ll compile and calculate the numbers and present them to you (we’ll even share our incredibly complex and sophisticated algorithm). Korean BBQ is generally a catch-all term for the entire experience of sitting around a hot grill, piling raw cuts of meat onto it, throwing back a few shots of soju, and trying to resist the urge to start digging in while the meat’s still cold. It’s not a specific dish, it’s the whole thing rolled up into one great night. 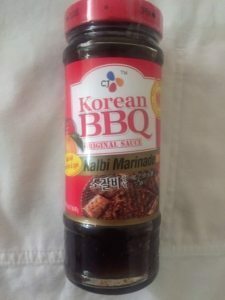 This one was a little easier since kalbi literally means ‘ribs’, so the criteria was boiled down to any bottle that had ‘Korean’ and ‘beef spare ribs’ on the label. Staying true to such a narrow and sophisticated criteria we perused the shelves of every grocery store we passed on the way home, and did the dirty work of searching for it in your favorite search engine. I even flew to New York and checked a bag on the way home because I happened to stop into three different Korean and Chinese grocery stores. As long as it’s sold commercially we’ll get it for you and test it out. The last condition is that it has to be for beef, the reason being is that beef spare ribs are the standard/default for this dish. I’d be all up for cooking up a mess of pork ribs to try them out, but we’ll save those for another post. Beef and pork ribs are treated very differently in practically every BBQ tradition so I have no problems being a little discriminatory at the moment. Currently all results are my own, we’ll be adding additional results as soon as I can coerce some people, we’ll give you some averages ASAP. 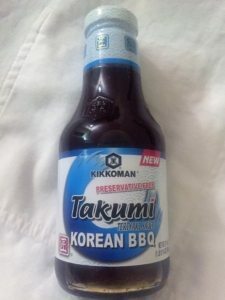 The main thing that I kept finding myself coming back to is the that although the flavors we’re looking for are very similar to that in our bulgogi marinade post, the goals between the two are vastly different. Spare ribs are generally much fattier and richer than rib eye, especially when the steak is shaved almost paper thin, which is generally how it comes in Korean grocery stores. It’s also a much more expensive cut of beef, so the challenge is not just to create a great dish, but to allow the meat to take center stage. A lot of sauces and marinades tend to mask or overpower the main component. All of this can be summed up into one question, why shell out $20 bucks or more for a cut of beef just to taste a $6 bottle of sauce?